Still waiting for the snow that was supposed to come today. There were some flurries this morning, but since then, it's all settled down. My friends are waiting for the snow to melt, and I'm wishing for one more before the season is over. That didn't stop me, however, from finishing the "Dancing Flowers" necklace I've been working on. Here's another picture of the set. 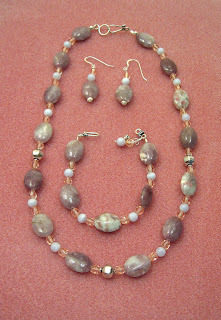 My hubby used a different background and the variations in the Lepidolite show up much better ... such a pretty stone.